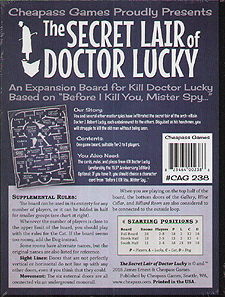 An Expansion Board for Kill Doctor Lucky Based on "Before I Kill You, Mister Spy..."
You and several other master spies have infiltrated the secret lair of the arch-villain Doctor J Robert Lucky, each unbeknownst to the others Disguised as his henchmen, you will struggle to kill the old man without being seen. One game board, suitable for 2 to 8 players. Optional: If you have it, you should choose a character card from "Before I Kill You, Mister Spy..."